MyCharge, a top manufacturer of the most advanced portable charging solutions, is expanding its Adventure series with new chargers for a quick daily boost to all-in-one hubs and inverters that can power TVs, laptops, and more. The Adventure series powers work and play. The new Adventure Jump Start is can be used to power up a dead vehicle battery. The Adventure Jump Start is a charger that can not only refuel devices, it can also power up a dead vehicle battery, too. The Adventure Jump Start features a 6600 mAh battery, enough for up to 4X extra battery for a smartphone. 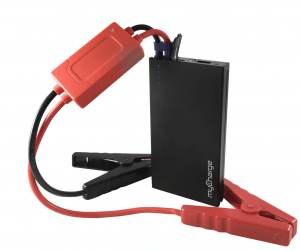 Compatible with most cars, trucks, boats and ATVs the myCharge Adventure Jump Start has a sustained jumpstart current of 200Z and a peak jumpstart current of 400A. The included smart jumpstart cables provide LED feedback for safe use. With myCharge on hand, the adventure never has to end due to a dead battery of any kind. The myCharge All Powerful makes it debut at CES 2018. It can charge via USB-A, USB-C, an AC outlet, or it can cu the cords with wireless charging. Two USB-A ports or the USB-C port can be used to charge smartphones, tablets, and USB-C laptops. Use the 65-watt AC outlet to run a 32-inch television, power most laptops, charge drone or camera batteries, even operate a fan or camping light. 10W Qi fast charge boosts devices enabled with wireless charging from low battery to full simply by setting them on the All Powerful. The myCharge All Powerful debuted at CES 2018 and will be available for purchase in April 2018 for $199.99. The Adventure Jump Start is available now at MyCharge.com and at retailers including Best Buy and Hudson News for $99.99. myCharge was at CES 2018 ShowStoppers.